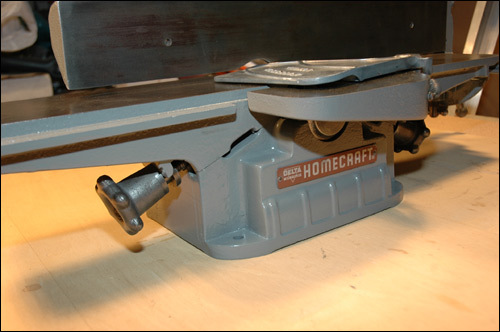 The Delta Homecraft Jointer Model No. 37-110 was priced for the homeowners budget and was a welcome addition to any shop. 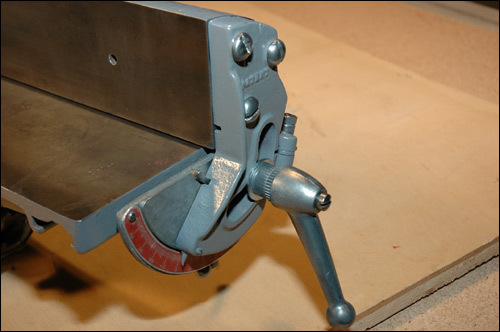 The jointer embodied many outstanding features found only in large commercial tools. It will rabbet up to 1/4 inch deep and has a 4-inch capacity in width of cut. 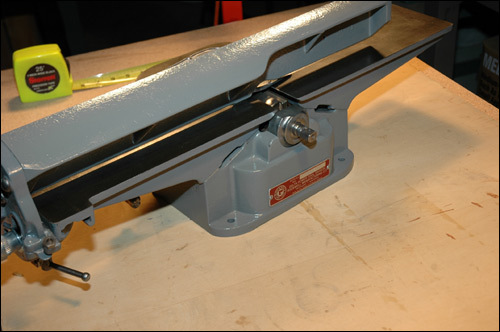 The Delta Homecraft Jointer fence is an accurately ground casting heavily ribbed for rigidity and to prevent warping. 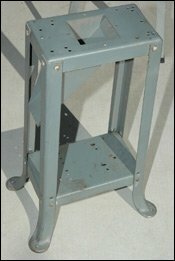 It is 20" long by 3" high; locks in place anywhere across the table; can be tilted 45 degrees to the right or left and is provided with an adjustable stop so that the fence can be returned to 90 degree setting without continual rechecking. Conveniently located control knobs in the front and back permit accurate setting of the table. Both the infeed and outfeed tables were finish ground after assembly, thus assuring true alignment. 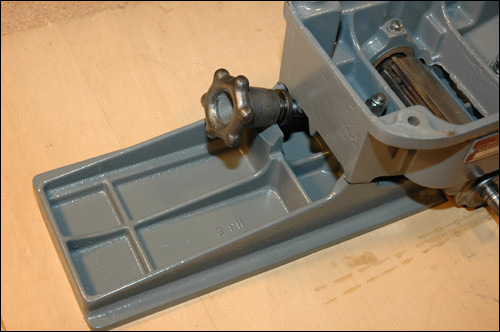 The solid steel cutterhead runs in sealed for life ball bearings. Three high speed steel knives are securely locked in dovetailed grooves of the cutterhead. 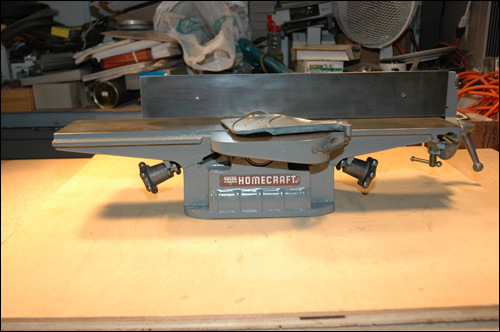 This Delta Homecraft Jointer was built for the home workshop, but it's definitely not a toy. It's heft made it a solid tool for the home shop. The fence tilting mechanism is shown above and provided handy, accurate scale. The fence can be tilted for any angle and tilt scale shows you the exact angle. The convenient ball end handle unlocks the fence, which can be slid the entire width of the table and locked in place at any position. 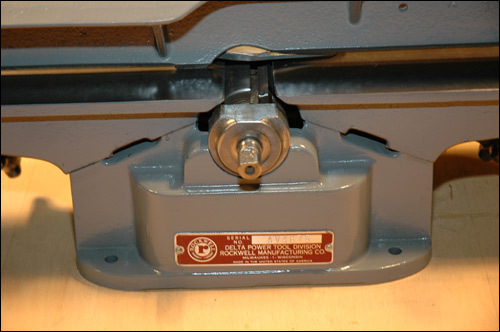 View of the back side of the jointer showing the fence, cutterhead where the cutterhead pulley will go, and base with Rockwell serial number tag. View of the underneath side of the rear table, rabbeting table, and machine base. Fawcett knob is for adjusting the height of the rear or outfeed table. This was a capacitor start, 115 volt, 60 cycle, 1725 r.p.m. motor with ball bearings and a 1/2 " diameter shaft. The motor speed was 1725 r.p.m. generated 10,800 cuts per minute. No. 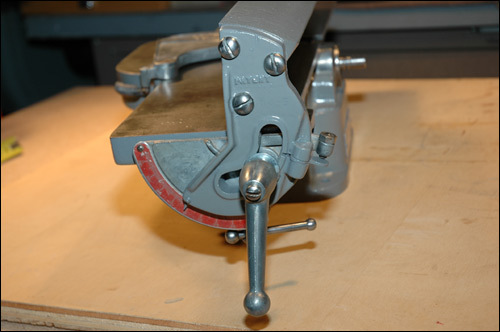 37-806 Jointer Cutterhead Assembly. The knife guard completely covered the jointer knives and slides back out of the way with the work. It was instantly removed for rabbeting and as quickly replaced. Steel splayed leg stand measures 7" wide x 12 1/2" long x 29" high. The early stands were welded together. 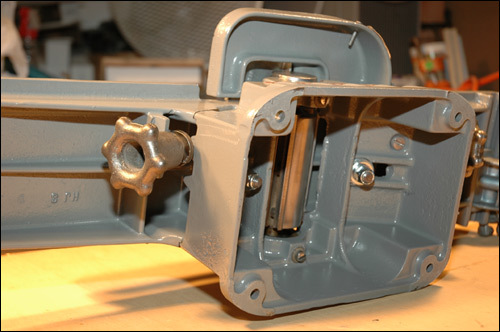 Later designs were bolted together and could be disassembled for easy shipping. The motor bolted onto the lower shelf. A dust chute accessory was also available. Overall fence dimensions..... 20" x 3"
Table length, overall..... 24 3/8"
Overall dimensions - 8 1/8" high x 28 1/8" long x 9 3/4" wide. Unit has sealed-for-life ball bearing requiring no further lubrication for the life of the bearings.